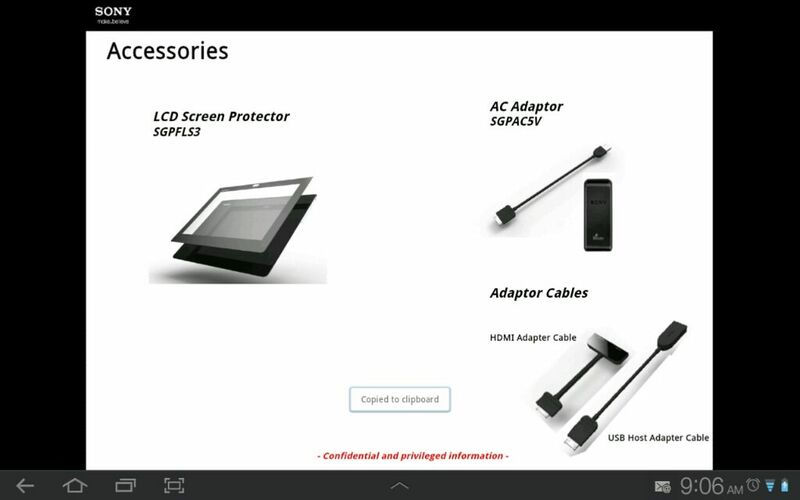 A handful of newly leaked slides have landed online, revealing plenty of details about an upcoming Sony Xperia tablet. Likely the successor to the Tablet S, this model will feature a 9.4-inch (1280×800) display, an NVIDIA Tegra 3 processor, 8.0-megapixel rear-facing camera, 1.0-megapixel front-facing camera, and 6000 mAh battery. Running Android 4.0 Ice Cream Sandwich, additional details tell us the tablet will come with a trio of storage capacity options: 16GB ($449), 32GB ($549), or 64GB ($649). 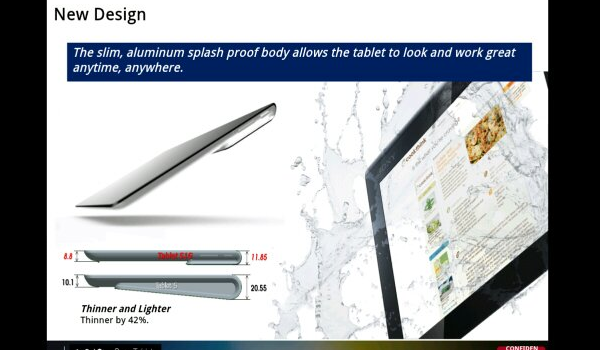 The design is reminiscent of the “folded back magazine” look of the Tablet S with the aluminum splash-proof device weighing only 570g. Also worth pointing out, the new model is 42% thinner than its predecessor. 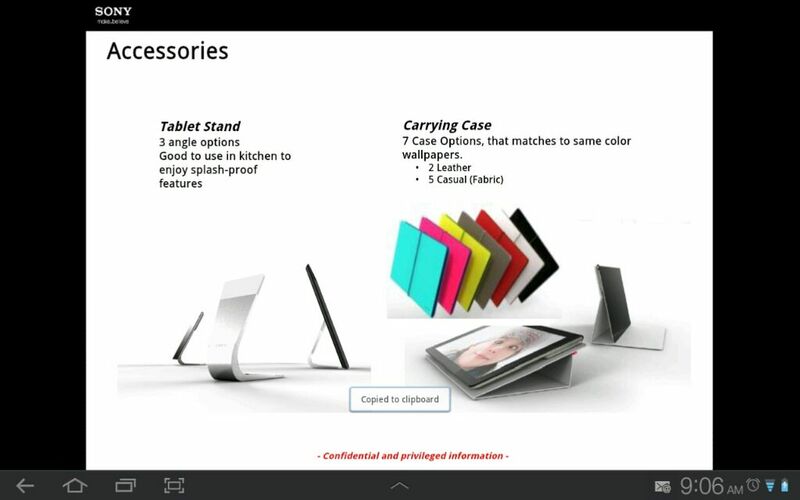 The slides show a number of accessories are being prepped for the Xperia tablet, including a charging cradle, docking stand, cover with keyboard, and carrying case. 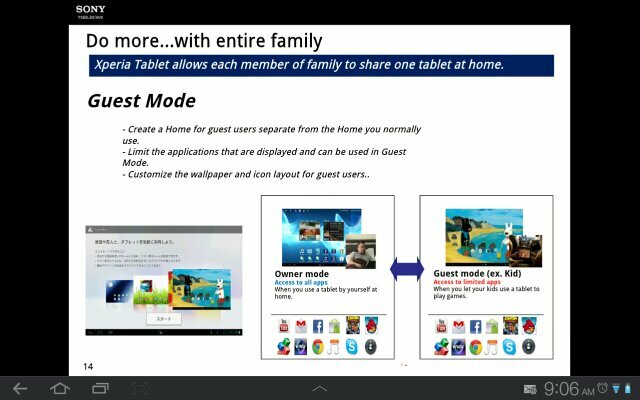 One of the slides indicate that Sony has designed some sort of “Guest Mode” for multiple users which would work well for those of us with kids. We’ve been waiting for tablets to feature this option as they tend to get passed around from user to user. This would provide peace of mind to folks who like to keep apps/pictures/videos/emails private. Considering just how much information is already known about the Xperia Tablet, it would make sense that an announcement is in short order. Perhaps we’ll get something in time for back-to-school season? Additional information and slides can be found on Xperia blog.